Be in control… We know how important business insights are to you, that’s why we’ve given our customers access to our business portal for free. Get an executive view and manage key business tasks in real-time, 24 hours a day, from anywhere in the world. See your sales, know what's selling and compare your performance. Add products to your point of sale, adjust prices and manage staff. Get daily sales summaries, export your data and store all receipts. It comes completely free to all Yoco Card Payments and Yoco Point of Sale customers. Works with any business, from small to big. So many configurations are catered for and there for you when you need it most. Like the data you need to get your next investment, or the Monday morning email with your sales snapshot. All sales made through a Yoco Card Reader or Yoco Point of Sale App (cash, eft, snapscan, zapper etc) become available in the business portal, in real-time, as actionable data. 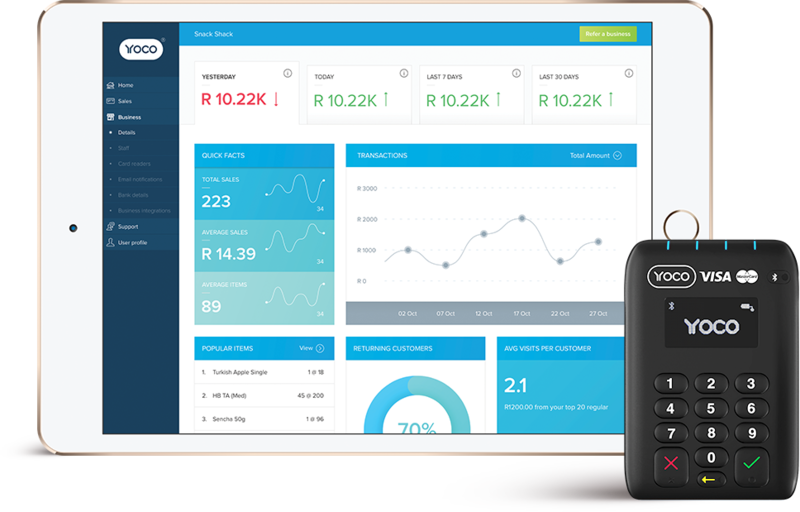 When using Yoco Point of Sale you can also manage all elements of your business, such as the products you have in your inventory, the price of your products, and which staff have access to what. Manage all of your products on the Yoco Point of Sale app in real-time through the Yoco Business Portal. Need to change a price, add or remove a product? Do it from anywhere and it updates in real-time to the Yoco Point of Sale app. Easily see how your business is doing and compare your performance by day, week, month or year. Manage your products and have changes reflect in real time. Change the price or edit products. It will reflect immediately on all of your staff member apps. Invite and manage staff members. Give them permissions based on their position. Save time on end of day cash-ups, your monthly recon and more. Connect your business to Xero and enjoy time-saving, hassle-free accounting. Seamlessly integrate Yoco card payments with Vend or TabletPOS. Shop a range of hardware and accessories to customise your countertop for a more professional look.